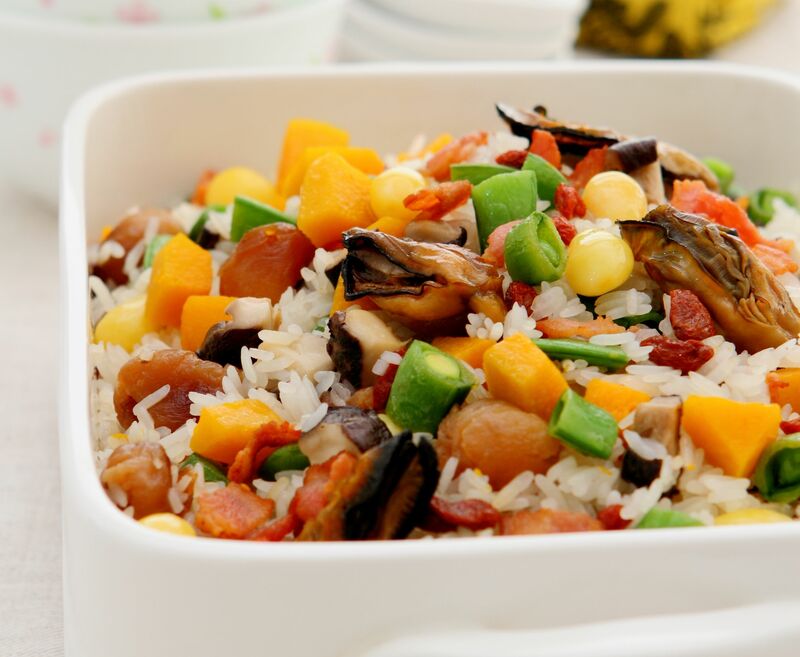 Rice was considered a delicacy during the Han dynasty (202 BC-AD 220) and symbolises good fortune and happiness. To the Chinese, white rice is also valued as cultured refinement, as only the rich could afford to eat rice in the old days. Taking a leaf out of an old la pa chu recipe – a sweet rice porridge with lotus seeds, red dates, almonds, two types of candied fruit, sweet bean paste and syrup to represent of the “eight immortals” – this eight-treasure rice recipe or Pat Poh Farn includes dried longans for longevity, assorted dried seafood for bountiful prosperity, pumpkin for its precious golden colour and sweet peas for a new beginning. NOTE: For a vegan version, substitute dried oysters and bacon with lotus seeds and red dates. Use vegetable stock or plain water to cook the rice. This recipe was first published in Flavours magazine. Heat up oil in a wok and sauté sweet peas and wolfberries for about 1 minute. Remove from pan and set aside. Heat up oil in another wok and sauté gingko nuts, dried oysters, mushrooms, dried longan and pumpkin. Add in salt, light soya sauce and water. Simmer for 5 minutes then dish out and set aside. Use chicken stock instead of water to cook rice in rice cooker the usual way. When stock is almost fully absorbed, add in condiments A, spread out evenly on top of the rice and cook for a further 10-15 minutes. Once rice is thoroughly cooked, fluff up the rice to mix the ingredients. Then add condiments B and mix well before serving. your recipes are interesting and i would like to try it out. please send me more recipes. Won’t 2 tbsp (tablespoons) of salt and 2 tbsp of light soya sauce ruin the dish? I will try with tsp (teaspoon) instead.